Wonderful "Woman:" Memorial Day's come and gone and Hollywood is still hoping for something wonderful to happen at the boxoffice. 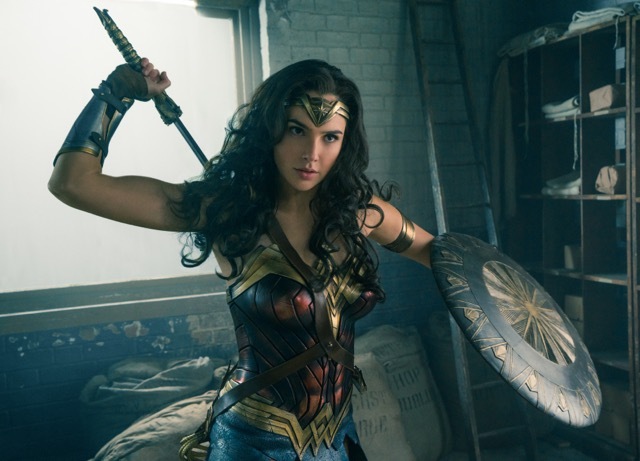 Neither of the long holiday weekend's wide arrivals fell into that category, but there are high hopes that Warner Bros., DC Entertainment and Dune Entertainment's 3D fantasy action adventure "Wonder Woman" will enjoy super-powered ticket sales when it opens Friday at about 4,000 theatres. Comic book titles typically play best to men, but "WW" should also attract women since it revolves around a rare comic book universe super heroine. It's also likely to be a magnet for male moviegoers thanks to Gal Gadot, who plays Wonder Woman and her alter ego Diana Prince. 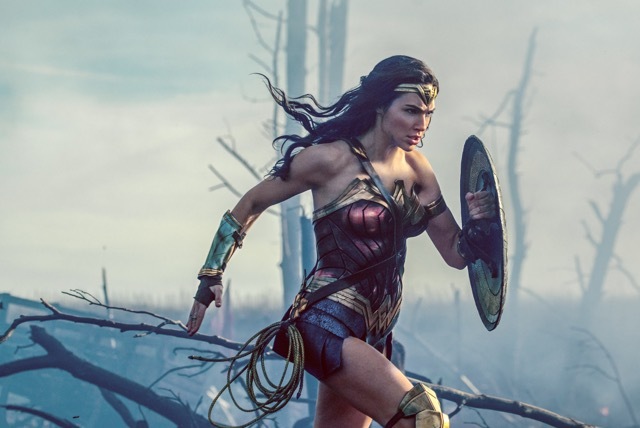 With likely support from men and women both under and over 25 – the four demographic quadrants that are the Holy Grail for movie marketers – "WW" could generate some serious summer ticket sales. Directed by Patty Jenkins ("Monster"), "WW" also stars Chris Pine and Robin Wright. Moviegoers first saw Gadot in her spandex uniform last summer in her brief intro role in "Batman v Superman: Dawn of Justice." A good indication of "WW's" prospects came last week with word from Fandango, the digital movie information company that does online and mobile ticket sales for some 29,000 screens, that film fans have voted it this summer's "most anticipated blockbuster." "More than 10,000 film fans voted online from April 27-May 19, representing the largest response to a moviegoer survey in the company's 17-year history," according to Fandango. "Fans were asked to pick the one movie they were most looking forward to seeing on the big screen between Memorial Day and Labor Day." Besides "WW," the survey's Top Five included: "Spider-Man: Homecoming," opening July 7; "Pirates of the Caribbean: Dead Men Tell No Tales," which arrived for Memorial Day; "The Dark Tower," opening Aug. 4; and "Dunkirk," opening July 21. "'Wonder Woman' is currently outpacing 'Captain America: The First Avenger' at the same point in the Fandango sales cycle," the ticket seller noted. A separate Fandango survey of "WW" fans found that: "92% are excited to see a standalone female superhero movie. 87% wish Hollywood would make more movies featuring female superheroes. 73% watched the 'Wonder Woman' TV show when they were kids." A super-muscular opening for "WW" will help turn the boxoffice tide after last weekend's $77 million four day launch at 4,276 theatres for Disney and Jerry Bruckheimer Films' 3D PG-13 rated fantasy action adventure "Pirates of the Caribbean: Dead Men Tell No Tales." Hollywood handicappers were buzzing earlier this month about "Tales" opening to around $100 million for four days. They later brought that down to around $80 million, which was closer to how it wound up opening. "Tales," however, is enjoying much deeper boxoffice waters abroad, where it did $208.4 million internationally last weekend, giving it a global cume of about $286 million. It reportedly cost about $230 million to produce. Directed by "Kon-Tiki" directors Joachim Ronning & Espen Sandberg, "Tales" stars: Johnny Depp, Geoffrey Rush, Javier Bardem and Orlando Bloom. Looking at some key territories, Disney reported over the weekend that, "The top international market is China with an estimated $67.8 million, the third highest 3 day opening weekend for any Disney title behind only 'Captain America: Civil War' and 'Avengers: Age of Ultron,' and should continue to benefit from the Dragon Boat holiday there (on May 30). "Russia also posted an incredible start with the highest opening weekend in industry history ($18.6 million, including previews). The film was #1 in all key markets. The international and global cumes do not include any grosses from Japan, where the film opens July 1." The four previous "Pirates" episodes grossed $1.3 billion domestically. The last one, "Pirates of the Caribbean: On Stranger Tides," opened to $90.2 million May 20, 2011, which was the weekend before Memorial Day that year. It did $241.1 million domestically and $804.6 million internationally. Disney said "Tales'" strong global showing would push "the franchise through the $4 billion threshold in the coming days." IMAX was an important part of "Pirates'" global success. IMAX said over the weekend that the film was the widest opening in its history with "1,088 IMAX screens across the globe, swashbuckling its way to $24 million of global IMAX box office treasure over the 4 day holiday weekend." In China, IMAX added, "Tales" will "generate a bounty of $9 million of IMAX box office on 401 screens, including results from Monday's start of the Dragon Boat Festival. The rest of international will produce $8 million of IMAX box office over the 4 day weekend. "In North America, (it) is on track to earn $7 million of IMAX box office over the 4 day weekend. IMAX was in 6 of the top 10 locations. Next week, Warner Bros.' 'Wonder Woman' is on 1,008 IMAX screens in 57 markets." Paramount, The Montecito Picture Company and Skydance Media's R rated comedy "Baywatch" kicked off quietly in third place to $23 million at 3,647 theatres for the four day weekend. Its domestic cume of $27.6 million, includes about $4.6 million last Thursday, of which about $1.25 million is from Wednesday night previews at 2,554 theatres. The film reportedly cost nearly $70 million to produce. Directed by Seth Gordon ("Horrible Bosses"), it stars: Dwayne Johnson, Zac Efron, Priyanka Chopra, Alexandra Daddario, Pamela Anderson and David Hasselhoff. Holdovers rounded out the Top Five. Disney and Marvel's "Guardians of the Galaxy" held on to second place in its fourth week with $25.2 million and a domestic cume of $338.5 million. 20th Century Fox and Scott Free Productions' R rated sci-fi thriller "Alien: Covenant" was fourth in week two with $13.2 million and a domestic cume of $60 million. Warner Bros. and MGM's PG-13 rated romantic drama "Everything, Everything" finished fifth in its second week with $7.4 million and a domestic cume of $22.7 million. Last weekend's domestic ticket sales for Friday – Monday were about $176 million, per comScore. It's the lowest MD four day total since 1999's $143.1 million, according to comScore. This year's $4.536 billion boxoffice to date, according to comScore, is up 1.9 percent vs. $4.450 billion a year ago. A week earlier, 2017 was ahead by 2.5 percent and the week before that it was up by 2.6 percent in comScore's tracking. 2017 could boost its lead over last year if "WW" delivers the boxoffice sizzle insiders are predicting. It helps that it's a film with broad playability. Its storyline, Warner's production notes explain, is about the origin of Diana, the only child of Themyscira, a secret island that was a gift from Zeus, king of the gods. Diana is from the world of Amazons and has devoted her life to preparing for combat. "I'm no different. I was seven years old when I first read Superman, and it rocked my world because I felt like Superman. The character captured exactly what I believed in then and still do: that there is a part of every human being that wishes they could change the world for the better." Looking back at Wonder Woman, she notes, "I watched the TV show, and she was everything a girl could aspire to be: strong and kind, exciting and stylish, powerful and effective, and just as fierce as the boys. She's a badass, and at the same time she stands for love, forgiveness and benevolence in a complicated world." Screenwriter Allan Heinberg, who wrote the Wonder Woman comic book for DC in 2006 and 2007, recalls: "Wonder Woman has been my all-time favorite Super Hero since I was a first-grader watching 'Super Friends' on Saturday mornings in Tulsa, Oklahoma." Gal Gadot says she was attracted to playing WW because "she is so many different things, and they live within her in such a beautiful way. And because this is the first time we're telling the story of this icon on film, Patty and I had many creative conversations about her. She's the greatest warrior in the comics, but she can also be vulnerable, sensitive, confident, and confused…everything, all at once. And she never hides her intelligence or her emotions." The comic's creator, William Moulton Marston, introduced Wonder Woman to readers in the middle of World War II, but the movie takes place in 1918, near the end of the First World War. Producer Charles Roven explains the filmmakers' thinking behind that time shift: "Juxtaposing this commanding female character who hails from a race of equally strong independent women with the early days of the suffragette movement was really interesting. "Secondly, from a visual perspective, the subtleties of the era better convey the true horrors of modern war. It was the first war where fighting went from close range in hand-to-hand combat, or if you shot somebody you had to be relatively close and face your adversary, to being fought from a distance. You could bomb some place without even knowing what your foe looked like, or who it is that you might be killing. It actually became easier to kill. "We wanted that new dynamic of war to be fresh for our character, Wonder Woman, because she is used to warriors being people you looked up to, and now she's looking at a war where there's no such thing as a hero, really, because you can't be a hero if you don’t know who you're fighting." "There's a purity to Wonder Woman that I love," adds producer Zack Snyder. "She doesn't have a broken past, she's not seeking revenge on the people who wronged her and she isn't coming from a dark place. She had an idyllic childhood and was taught to value life. She can be a hero purely from a place of wanting to do what's right in the world, which is really cool, and I think both Patty and Gal found the perfect way to convey that in the movie." "Patty’s excitement followed her all through shooting," says producer Deborah Snyder. "She looked up to the character, and she felt a great responsibility, as did the rest of the team, to make sure she brought Wonder Woman to the screen in the most honest way possible. "This is a figure who came before us and will outlast us, who fights for freedom and justice but also believes in love. I think that makes her enormously compelling." When a man – actually, the first one Diana's ever seen – turns up on shore, it opens her eyes to the larger world beyond her sheltered island. 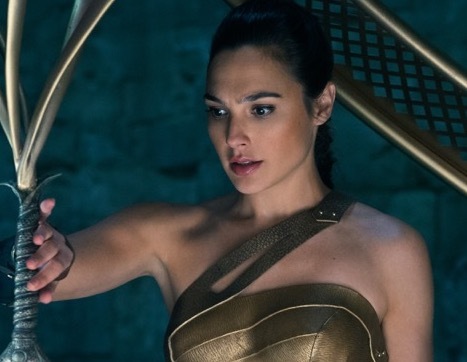 "She saves his life and, in turn, it's Steve Trevor who teaches Diana about man's world," producer Richard Suckle points out. Despite its likely boxoffice muscles, "WW" won't have this weekend entirely to itself. Also opening wide is 20th Century Fox and DreamWorks Animation's PG rated animated action family comedy "Captain Underpants: The First Epic Movie" at about 3,300 theatres. Directed by David Soren ("Turbo"), it stars the voices of Kevin Hart, Ed Helms and Nick Kroll. Its storyline revolves around two highly imaginative young pranksters, who hypnotize their school principal into believing he's a dimwitted superhero called Captain Underpants. DreamWorks Animation and Fox's last animated feature was "The Boss Baby," which opened Mar. 31, 2017 to $50.2 million and has a domestic cume of $169.6 million. It's still playing and came in ninth last weekend with $2.3 million for four days. Its international cume is $307.2 million. Bottom line: This Memorial Day didn't pack the multiplexes even though rain put a damper on competing outdoors activities on the East Coast and in the Mid-West. Next year, however, could be another story. MD 2018 could bring back the kind of boxoffice excitement that used to go hand in hand with the summer's first holiday weekend. What could put MD back on the Hollywood map is Disney and Lucasfilm's presently untitled Han Solo "Star Wars" Anthology Film, opening next May 25. Directed by Phil Lord & Christopher Miller, its screenplay is by Lawrence Kasdan & Jonathan Kasdan. Lord & Miller directed Warner Bros. and LEGO System's PG rated animated adventure "The Lego Movie," which opened Feb. 7, 2014 to $69.1 million. It did $257.8 million domestically and $211.4 million internationally. Lawrence Kasdan's many writing credits include the "Star Wars" episodes "The Empire Strikes Back," "Return of the Jedi" and "The Force Awakens" as well as "Raiders of the Lost Ark" and "The Big Chill." The Han Solo spin-off's stars include: Alden Ehrenreich, Donald Glover, Emilia Clarke, Woody Harrelson, Thandie Newton, Phoebe Waller-Bridge, Joonas Suotamo, Michael K. Williams and Ian Kenny. The 3D and IMAX sci-fi action adventure tells how the young Han Solo became the scoundrel, smuggler and thief that Luke Skywalker and Obi-Wan Kenobi first met?